Redirecting to: www.famous-trials.com/socrates in (10) seconds. Socrates: How you, O Athenians, have been affected by my accusers, I cannot tell; but I know that they almost made me forget who I was, so persuasively did they speak; and yet they have hardly uttered a word of truth. But of the many falsehoods told by them, there was one which quite amazed me; I mean when they said that you should be upon your guard and not allow yourselves to be deceived by the force of my eloquence. To say this, when they were certain to be detected as soon as I opened my lips and proved myself to be anything but a great speaker, did indeed appear to me most shameless, unless by the force of eloquence they mean the force of truth; for if such is their meaning, I admit that I am eloquent. But in how different a way from theirs! Well, as I was saying, they have scarcely spoken the truth at all; but from me you shall hear the whole truth: not, however, delivered after their manner in a set oration duly ornamented with words and phrases. No, by heaven! but I shall use the words and arguments which occur to me at the moment; for I am confident in the justice of my cause: at my time of life I ought not to be appearing before you, O men of Athens, in the character of a juvenile orator, let no one expect it of me. And I must beg of you to grant me a favor:, If I defend myself in my accustomed manner, and you hear me using the words which I have been in the habit of using in the agora, at the tables of the money-changers, or anywhere else, I would ask you not to be surprised, and not to interrupt me on this account. For I am more than seventy years of age, and appearing now for the first time in a court of law, I am quite a stranger to the language of the place; and therefore I would have you regard me as if I were really a stranger, whom you would accuse if he spoke in his native tongue, and after the fashion of his country:, Am I making an unfair request of you? Never mind the manner, which may or may not be good; but think only of the truth of my words, and give heed to that: let the speaker speak truly and the judge decide justly. And first, I have to reply to the older charges and to my first accusers, and then I will go on to the later ones. For of old I have had many accusers, who have accused me falsely to you during many years; and I am more afraid of them than of Anytus and his associates, who are dangerous, too, in their own way. But far more dangerous are the others, who began when you were children, and took possession of your minds with their falsehoods, telling of one Socrates, a wise man, who speculated about the heaven above, and searched into the earth beneath, and made the worse appear the better cause. The disseminators of this tale are the accusers whom I dread; for their hearers are apt to fancy that such inquirers do not believe in the existence of the gods. And they are many, and their charges against me are of ancient date, and they were made by them in the days when you were more impressionable than you are now, in childhood, or it may have been in youth , and the cause when heard went by default, for there was none to answer. And hardest of all, I do not know and cannot tell the names of my accusers; unless in the chance case of a Comic poet. 1 All who from envy and malice have persuaded you, some of them having first convinced themselves, all this class of men are most difficult to deal with; for I cannot have them up here, and cross-examine them, and therefore I must simply fight with shadows in my own defense, and argue when there is no one who answers. I will ask you then to assume with me, as I was saying, that my opponents are of two kinds; one recent, the other ancient: and I hope that you will see the propriety of my answering the latter first, for these accusations you heard long before the others, and much oftener. Well, then, I must make my defense, and endeavor to clear away in a short time, a slander which has lasted a long time. May I succeed, if to succeed be for my good and yours, or likely to avail me in my cause. The task is not an easy one; I quite understand the nature of it. And so leaving the event with God, in obedience to the law I will now make my defense. I will begin at the beginning, and ask what is the accusation which has given rise to the slander of my person, and in fact has encouraged Meletus to prefer this charge against me, Well, what do the slanderers say? They shall be my prosecution and I will sum up their words in an affidavit: "Socrates is an evil-doer, and a curious person, who searches into things under the earth and in heaven, and he makes the worse appear the better cause; and he teaches the aforesaid doctrines to others." Such is the nature of the accusation: it is just what you have yourselves have seen in the comedy of Aristophanes, who has introduced a man whom he calls Socrates going about and saying that he walks in air and talking a deal of nonsense concerning matters of which I do not pretend to know either much or little, not that I mean to speak disparagingly of any one who is a student of natural philosophy. I should be very sorry if Meletus could bring so grave a charge against me. But the simple truth is, O Athenians, that I have nothing to do with physical speculations: many of those here present are witnesses to the truth of this, and to them I appeal. Speak then, you who have heard me, and tell your neighbors whether any of you have ever known me hold forth in few words or in many upon such matters. . . . You hear their answer. And from what they say of this part of the charge you will be able to judge of the truth of the rest. As little foundation is there for the report that I am a teacher, and take money; this accusation has no more truth in it than the other. Although, if a man were really able to instruct mankind, to receive money for giving instruction would, in my opinion, be an honor to him. There is Gorgias of Leontium, and Prodicus of Ceos, and Hippias of Elis, who go the round of the cities, and are able to persuade the young men to leave their own citizens by whom they might be taught for nothing, and come to them whom they not only pay, but are thankful if they may be allowed to pay them. There is at this time a Parian philosopher residing in Athens, of whom I have heard; and I came to hear of him in this way:, I came across a man who has spent a world of money on the Sophists, Callias, the son of Hipponicus, and knowing that he had sons, I asked him: '"Callias," I said, 'if your two sons were foals or calves there would be no difficulty in finding some one to put over them; we should hire a trainer of horses, or a farmer probably, who would improve and perfect them in their own proper virtue and excellence; but as they are human beings, whom are you thinking of placing over them? Is there any one who understands human and political virtue? You must have thought about the matter, for you have sons; is there any one?" 'There is," he said. 'Who is he?" said I; "and of what country? and what does he charge?" "Evenus the Parian," he replied; "he is the man, and his charge is five minae." Happy is Evenus, I said to myself, if he really has this wisdom, and teaches at such a moderate charge. Had I the same, I should have been very proud and conceited; but the truth is that I have no knowledge of the kind. I dare say, Athenians, that some one among you will reply, "Yes, Socrates, but what is the origin of these accusations which are brought against you; there must have been something strange which you have been doing? All these rumors and this talk about you would never have arisen if you had been like other men: tell us, then, what is the cause of them, for we should be sorry to judge hastily of you." Now I regard this as a fair challenge, and I will endeavor to explain to you the reason why I am called wise and have such an evil fame. Please to attend then. And although some of you may think that I am joking, I declare that I will tell you the entire truth. Men of Athens, this reputation of mine has come of a certain sort of wisdom which I possess. If you ask me what kind of wisdom, I reply, wisdom such as may perhaps be attained by every man, for to that extent I am inclined to believe that I am wise; whereas the persons of whom I was speaking have a superhuman wisdom, which I may fail to describe, because I have it not myself; and he who says that I have, speaks falsely, and is taking away my character. And here, O men of Athens, I must beg you not to interrupt me, even if I seem to say something extravagant. For the word which I will speak is not mine. I will refer you to a witness who is worthy of credit; that witness shall be the God of Delphi, he will tell you about my wisdom, if I have any, and of what sort it is. You must have known Chaerephon; he was early a friend of mine, and also a friend of yours, for he shared in the recent exile of the people, and returned with you. Well, Chaerephon, as you know, was very impetuous in all his doings, and he went to Delphi 2 and boldly asked the oracle to tell him whether, as I was saying, I must beg you not to interrupt, he asked the oracle to tell him whether any one was wiser than I was, and the Pythian prophetess answered, that there was no man wiser. Chaerephon is dead himself; but his brother, who is in court, will confirm the truth of what I'm saying. Why do I mention this? Because I am going to explain to you why I have such an evil name. When I heard the answer, I said to myself, What can the god mean? and what is the interpretation of his riddle? for I know that I have no wisdom, small or great. What then can he mean when he says that I am the wisest of men? And yet he is a god, and cannot lie; that would be against his nature. After long consideration, I thought of a method of trying the question. I reflected that if I could only find a man wiser than myself, then I might go to the god with a refutation in my hand. I should say to him, "Here is a man who is wiser than I am; but you said that I was the wisest." Accordingly I went to one who had the reputation of wisdom, and observed him, his name I need not mention; he was a politician whom first among I selected for examination, and the result was as follows: When I began to talk with him, I could not help thinking that he was not really wise, although he was thought wise by many, and still wiser by himself; and thereupon I tried to explain to him that he thought himself wise, but was not really wise; and the consequence was that he hated me, and his enmity was shared by several who were present and because I heard me. So I left him, saying to myself, as I went away: conceit of Man, although I do not suppose that either of us knows anything really beautiful and good, I am better off than he is, for he knows nothing, and thinks that he knows; I neither know nor think that I know. In this latter particular, then, I seem to have slightly the advantage of him. Then I went to another who had still higher pretensions to wisdom, and my conclusion was exactly the same. Whereupon I made another enemy of him, and of many others besides him. Then I went to one man after another, being not unconscious of the enmity which I provoked, and I lamented and feared this: but necessity was laid upon me, the word of God, I thought, ought to be considered first. And I said to myself, I must go to all who appear to know, and find out the meaning of the oracle. And I swear to you, Athenians, by the dog I swear!, for I must tell you the truth, the result of my mission was just this: I found that the men most in repute were all but the most foolish; and that others less esteemed were really wiser and better. I will tell you the whole of my wanderings and of the 'Herculean' labors, as I may call them, which I endured only to find at last the oracle irrefutable. After the politicians, I went to the poets; tragic, dithyrambic, and all sorts. And there, I said to myself, you will be instantly detected; now you will find out that you are more ignorant than they are. Accordingly, I took them some of the most elaborate passages in their own writings, and asked what was the meaning of them, thinking that they would teach me something. Will you believe me? I am almost ashamed to confess the truth, but I must say that there is hardly a person present who would not have talked better about their poetry than they did themselves. Then I knew that not by wisdom do poets write poetry, but by a sort of genius and inspiration; they are like diviners or soothsayers who also say many fine things, but do not understand the meaning of them. The poets appeared to me to be much in the same case; and I further observed that upon the strength of their poetry they believed themselves to be the wisest of men in other things in which they were not wise. So I departed, conceiving myself to be superior to them for the same reason that I was superior to the politicians. At last I went to the artisans; I was conscious that I knew nothing at all, as I may say, and I was sure that they knew many fine things; and here I was not mistaken, for they did know many things of which I was ignorant, and in this they certainly were wiser than I was. But I observed that even the good artisans fell into the same error as the poets;, because they were good workmen they thought that they also knew all sorts of high matters, and this defect in them overshadowed their wisdom; and therefore I asked myself on behalf of the oracle, whether I would like to be as I was, neither having their knowledge nor their ignorance, or like them in both; and I made answer to myself and to the oracle that I was better off as I was. This inquisition has led to my having many enemies of the worst and most dangerous kind, and has given occasion also to many calumnies. And I am called wise, for my hearers always imagine that I myself possess the wisdom which I find wanting in others: but the truth is, O men of Athens, that God only is wise; and by his answer he intends to show that the wisdom of men is worth little or nothing; he is not speaking of Socrates, he is only using my name by way of illustration, as if he said, O men, he is the wisest, who, like Socrates, knows that his wisdom is in truth worth nothing. And so I go about the world, obedient to the god, and search and make enquiry into the wisdom of any one, whether citizen or stranger, who appears to be wise; and if he is not wise, then I show him that he is not wise; and my occupation quite absorbs me, and I have no time to give attention to any public matter of interest or to any concern of my own, but I am in utter poverty by reason of my devotion to the god. There is another thing:—young men of the richer classes, who have not much to do, come about me of their own accord; they like to hear the pretenders examined, and they often imitate me, and proceed to examine others; there are plenty of persons, as they quickly discover, who think that they know something, but really know little or nothing; and then those who are examined by them, instead of being angry with themselves are angry with me: this confounded Socrates, they say; this villainous misleader of youth!, and then if somebody asks them, Why, what evil does he practice or teach?, they do not know, and can't tell; but in order that they may not appear to be at a loss, they repeat the ready-made charges which are used against all philosophers about teaching things up in the clouds and under the earth, and making the worse appear the better cause; for they do not like to confess that their pretense of knowledge has been detected, which is the truth; and as they are numerous and ambitious and energetic, and are drawn up in battle array and have persuasive tongues, they have filled your ears with their loud and inveterate calumnies. And this is the reason why my three accusers, Meletus and Anytus and Lycon, have set upon me; Meletus, who has a quarrel with me on behalf of the poets; Anytus, on behalf of the craftsmen and politicians; Lycon, on behalf of the rhetoricians: and as I said at the beginning, I cannot expect to get rid of such a mass of calumny all in a moment. And this, O men of Athens, is the truth and the whole truth; I have concealed nothing, I have dissembled nothing. And yet, I know that my plainness of speech makes them hate me, and what is their hatred but a proof that I am speaking the truth?, Hence has arisen the prejudice against me; and this is the reason of it, as you will find out either in this or in any future enquiry. I have said enough in my defense against the first class of my accusers; I turn to the second class. They are headed by Meletus, that good man and true lover of his country, as he calls himself. Against these, too, I must try to make a defense:, Let their affidavit be read: it contains something of this kind: It says that Socrates is a doer of evil, who corrupts the youth; and who does not believe in the gods of the state, but has other new divinities of his own. Such is the charge; and now let us examine the particular counts. He says that I am a doer of evil, and corrupt the youth; but I say, O men of Athens, that Meletus is a doer of evil, in that he pretends to be in earnest when he is only in jest, and is so eager to bring men to trial from a pretended zeal and interest about matters in which he really never had the smallest interest. And the truth of this I will endeavor to prove to you. Tell the judges, then, who is their improver; for you must know, as you have taken the pains to discover their corrupter, and are citing and accusing me before them. Speak, then, and tell the judges who their improver is., Observe, Meletus, that you are silent, and have nothing to say. But is not this rather disgraceful, and a very considerable proof of what I was saying, that you have no interest in the matter? Speak up, friend, and tell us who their improver is. By the goddess Hera, that is good news! There are plenty of improvers, then. And what do you say of the audience, do they improve them? But perhaps the members of the assembly corrupt them?, or do they too improve them? I am very unfortunate if you are right. But suppose I ask you a question: How about horses? Does one man do them harm and all the world good? Is not the exact opposite fact does the truth? One man is able to do them good, the trainer of horses, that is to say, does them good, and others who have to do with them rather injure them? Is not that true, Meletus, of horses, or of any other animals? Most assuredly it is; whether you and Anytus say yes or no. Happy indeed would be the condition of youth if they had one corrupter only, and all the rest of the world were their improvers. But you, Meletus, have sufficiently shown that you never had a thought about the young: your carelessness is seen in your not caring about the very things which you bring against me. And now, Meletus, I will ask you another question, by Zeus I will: Which is better, to live among bad citizens, or among good ones? Answer, friend, I say; the question is one which may be easily answered. Do not the good do their neighbors good, and the bad do them evil? And is there any one who would rather be injured than benefited by those who live with him? Answer, my good friend, the law requires you to answer, does any one like to be injured? But you have just admitted that the good do their neighbors good, and the evil do them evil. Now, is that a truth which your superior wisdom has recognized thus early in life, and am I, at my age, in such darkness and ignorance as not to know that if a man with whom I have to live is corrupted by me, I am very likely to be harmed by him; and yet I corrupt him, and intentionally, too, so you say, although neither I nor any other human being is ever likely to be convinced by you. But either I do not corrupt them, or I corrupt them unintentionally; and on either view of the case you lie. If my offense is unintentional, the law has no cognizance of unintentional offenses: you ought to have taken me privately, and warned and admonished me; for if I had been better advised, I should have left off doing what I only did unintentionally, no doubt I should; but you would have nothing to say to me and refused to teach me. And now you bring me up in this court, which is a place not of instruction, but of punishment. Then, by the gods, Meletus, of whom we are speaking, tell me and the court, in somewhat plainer terms, what you mean, for I do not as yet understand whether you affirm that I teach other men to acknowledge some gods, and therefore that I do believe in gods, and am not an entire atheist, this you do not lay to my charge,, but only you say that they are not the same gods which the city recognizes-, the charge is that they are different gods. Or, do you mean that I am an atheist simply, and a teacher of atheism? I mean the latter, that you are a complete atheist. Friend Meletus, you think that you are accusing Anaxagoras: and you have but a bad opinion of the judges, if you fancy them illiterate to such a degree as not to know that these doctrines are found in the books of Anaxagoras the Clazomenian, which are full of them. And so, forsooth, the youth are said to be taught them by Socrates, when there are not infrequently exhibitions of them at the theatre (price of admission one drachma at the most); and they might pay their money, and laugh at Socrates if he pretends to father these extraordinary views. And so, Meletus, you really think that I do not believe in any god? Nobody will believe you, Meletus, and I am pretty sure that you do not believe yourself. I cannot help thinking, men of Athens, that Meletus is reckless and impudent, and that he has written this indictment in a spirit of mere wantonness and youthful bravado. Has he not compounded a riddle, thinking to try me? He said to himself:, I shall see whether the wise Socrates will discover my facetious contradiction, or whether I shall be able to deceive him and the rest of them. For he certainly does appear to me to contradict himself in the indictment as much as if he said that Socrates is guilty of not believing in the gods, and yet of believing in them, but this is not like a person who is in earnest. Did ever man, Meletus, believe in the existence of human things, and not of human beings? . . . I wish, men of Athens, that he would answer, and not be always trying to get up an interruption. Did ever any man believe in horsemanship, and not in horses? or in flute-playing, and not in flute players? No, my friend; I will answer to you and to the court, as you refuse to answer for yourself. There is no man who ever did. But now please to answer the next question: Can a man believe in spiritual and divine agencies, and not in spirits or demigods? How lucky I am to have extracted that answer, by the assistance of the court. But then you swear in the indictment that I teach and believe in divine or spiritual agencies (new or old, no matter for that); at any rate, I believe in spiritual agencies, so you say and swear in the affidavit; and yet if I believe in divine beings, how can I help believing in spirits or demigods; must I not? To be sure I must; and therefore I may assume that your silence gives consent. Now what are spirits or demigods? are they not either gods or the sons of gods? But this is what I call the facetious riddle invented by you: the demigods or spirits are gods, and you say first that I do not believe in gods, and then again that I do believe in gods; that is, if I believe in demigods. For if the demigods are the illegitimate sons of gods, whether by the nymphs or by any other mothers, of whom they are said to be the sons, what human being will ever believe that there are no gods if they are the sons of gods? You might as well affirm the existence of mules, and deny that of horses and asses. Such nonsense, Meletus, could only have been intended by you to make trial of me. You have put this into the indictment because you had nothing real of which to accuse me. But no one who has a particle of understanding will ever be convinced by you that the same men can believe in divine and superhuman things, and yet not believe that there are gods and demigods and heroes. I have said enough in answer to the charge of Meletus: any elaborate defense is unnecessary; but I know only too well how many are the enmities which I have incurred, and this is what will be my destruction if I am destroyed; not Meletus nor yet Anytus, but the envy and detraction of the world, which has been the death of many good men, and will probably be the death of many more; there is no danger of my being the last of them. Some one will say: And are you not ashamed, Socrates, of a course of life which is likely to bring you to an untimely end? To him I may fairly answer: There you are mistaken: a man who is good for anything ought not to calculate the chance of living or dying; he ought only to consider whether in doing anything he is doing right or wrong, acting the part of a good man or of a bad. Whereas, upon your view, the heroes who fell at Troy were not good for much, and the son of Thetis (3) above all, who altogether despised danger in comparison with disgrace; and when he was so eager to slay Hector, his goddess mother said to him, that if he avenged his companion Patroclus, and slew Hector, he would die himself, "Fate," she said, in these or the like words, "waits for you next after Hector;" he, receiving this warning, utterly despised danger and death, and instead of fearing them, feared rather to live in dishonor, and not to avenge his friend. "Let me die forthwith," he replies, "and be avenged of my enemy, rather than abide here by the beaked ships, a laughing-stock and a burden of the earth." Had Achilles any thought of death and danger? For wherever a man's place is, whether the place which he has chosen or that in which he has been placed by a commander, there he ought to remain in the hour of danger; he should not think of death or of anything but of disgrace. And this, O men of Athens, is a true saying. Strange, indeed, would be my conduct, O men of Athens, if I who, when I was ordered by the generals whom you chose to command me at Potidaea and Amphipolis and Delium, remained where they placed me, like any other man, facing death, if now, when, as I conceive and imagine, God orders me to fulfill the philosopher's mission of searching into myself and other men, I were to desert my post through fear of death, or any other fear; that would indeed be strange, and I might justly be arraigned in court for denying the existence of the gods, if I disobeyed the oracle because I was afraid of death, fancying that I was wise when I was not wise. For the fear of death is indeed the pretense of wisdom, and not real wisdom, being a pretense of knowing the unknown; and no one knows whether death, which men in their fear apprehend to be the greatest evil, may not be the greatest good. Is not this ignorance of a disgraceful sort, the ignorance which is the conceit that a man knows what he does not know? And in this respect only I believe myself to differ from men in general, and may perhaps claim to be wiser than they are:—that whereas I know but little of the world below, I do not suppose that I know: but I do know that injustice and disobedience to a better, whether God or man, is evil and dishonorable, and I will never fear or avoid a possible good rather than a certain evil. And therefore if you let me go now, all you who are not convinced by Anytus, who said that since I had been prosecuted I must be put to death; (or if not that I ought never to have been prosecuted at all; and that if I escape now, your sons will all be utterly ruined by listening to my words, if you say to me, Socrates, this time we will not mind Anytus, and you shall be let off, but upon one condition, that you are not to enquire and speculate this way any more, and that if you are caught doing so again you shall die;, if this was the condition on which you let me go, I should reply: Men of Athens, I honor and love you; but I shall obey God rather than you, and while I have life and strength I shall never cease from the practice and teaching of philosophy, exhorting any one whom I meet and saying to him after my manner: You, my friend, a citizen of the great and mighty and wise city of Athens,, are you not ashamed of heaping up the greatest amount of money and honor and reputation, and caring so little about wisdom and truth and the greatest improvement of the soul, which you never regard or heed at all? And if the person with whom I am arguing, says: Yes, but I do care; then I do not leave him or let him go at once; but I proceed to interrogate and examine and cross-examine him, and if I think that he has no virtue in him, but only says that he has, I reproach him with undervaluing the greater, and overvaluing the less. And I shall repeat the same words to every one whom I meet, young and old, citizen and alien, but especially to the citizens, inasmuch as they are my brethren. For know that this is the command necessity of God; and I believe that no greater good has ever happened in the state than my service to the God. For I do nothing but go about persuading you all, old and young alike, not to take thought for your persons or your properties, but first and chiefly to care about the greatest improvement of the soul. I tell you that virtue is not given by money, but that from virtue comes money and every other good of man, public as well as private. This is my teaching, and if this is the doctrine which corrupts the youth, I am a mischievous person. But if any one says that this is not my teaching, he is speaking an untruth. Wherefore, O men of Athens, I say to you, do as Anytus bids or not as Anytus bids, and either acquit me or not; but whichever you do, understand that I shall never alter my ways, not even if I have to die many times. Men of Athens, do not interrupt, but hear me; there was an understanding between us that you should hear me to the end: I have something more to say, at which you may be inclined to cry out; but I believe that to hear me will be good for you, and therefore I beg that you will not cry out. I would have you know, that if you kill such an one as I am, you will injure yourselves more than you will injure me. Nothing will injure me, not Meletus nor yet Anytus, they cannot, for a bad man is not permitted to injure a better than himself. I do not deny that Anytus may, perhaps, injure me; and he may imagine, and others may imagine, that he is inflicting a great injury: but there I do not agree. For the evil of doing as he is doing, the evil of unjustly taking away the life of another, is greater far. And now, Athenians, I am not going to argue for my own sake, as you may think, but for that you may not sin against the God by condemning me, who am his gift to you. For if you kill me you will not easily find a successor to me, who, if I may use such a ludicrous figure of speech, am a sort of gadfly, given to the state by God; and the state is a great and noble steed who is tardy in his motions owing to his very size, and requires to be stirred into life. I am that gadfly which God has attached to the state, and all day long and in all places am always fastening upon you, arousing and persuading and reproaching you. You will not easily find another like me, and therefore I would advise you to spare me. I dare say that you may feel out of temper (like a person who is suddenly awakened from sleep), and you think that you might easily strike me dead as Anytus advises, and then you would sleep on for the remainder of your lives, unless God in his care of you sent you another gadfly. When I say that I am given to you by God, the proof of my mission is this:, if I had been like other men, I should not have neglected all my own concerns or patiently seen the neglect of them during all these years, and have been doing yours, coming to you individually like a father or elder brother, exhorting you to regard virtue; such conduct, I say, would be unlike human nature. If I had gained anything, or if my exhortations had been paid, there would have been some sense in my doing so; but now, as you will perceive, not even the impudence of my accusers dares to say that I have ever exacted or sought pay of any one; of that they have no witness. And I have a sufficient witness to the truth of what I say, my poverty. Some one may wonder why I go about in private giving advice and busying myself with the concerns of others, but do not venture to come forward in public and advise the state. I will tell you why. You have heard me speak at sundry times and in diverse places of an oracle or sign which comes to me, and is the divinity which Meletus ridicules in the indictment. This sign, which is a kind of voice, first began to come to me when I was a child; it always forbids but never commands me to do anything which I am going to do. This is what deters me from being a politician. And rightly, as I think. For I am certain, O men of Athens, that if I had engaged in politics, I should have perished long ago, and done no good either to you or to myself. And do not be offended at my telling you the truth: for the truth is, that no man who goes to war with you or any other multitude, honestly striving against the many lawless and unrighteous deeds which are done in a state, will save his life; he who will fight for the right, if he would live even for a brief space, must have a private station and not a public one. I can give you convincing evidence of what I say, not words only, but what you value far more, actions. Let me relate to you a passage of my own life which will prove to you that I should never have yielded to injustice from any fear of death, and that 'as I should have refused to yield' I must have died at once. I will tell you a tale of the courts, not very interesting perhaps, but nevertheless true. The only office of state which I ever held, O men of Athens, was that of senator: the tribe Antiochis, which is my tribe, had the presidency at the trial of the generals who had not taken up the bodies of the slain after the battle of Arginusae; and you proposed to try them in a body, contrary to law, as you all thought afterwards; but at the time I was the only one of the Prytanes who was opposed to the illegality, and I gave my vote against you; and when the orators threatened to impeach and arrest me, and you called and shouted, I made up my mind that I would run the risk, having law and justice with me, rather than take part in your injustice because I feared imprisonment and death. This happened in the days of the democracy. But when the oligarchy of the Thirty was in power, they sent for me and four others into the rotunda, and bade us bring Leon the Salaminian from Salamis, as they wanted to put him to death. This was a specimen of the sort of commands which they were always giving with the view of implicating as many as possible in their crimes; and then I showed, not in word only but in deed, that, if I may be allowed to use such an expression, I cared not a straw for death, and that my great and only care was lest I should do an unrighteous or unholy thing. For the strong arm of that oppressive power did not frighten me into doing wrong; and when we came out of the rotunda the other four went to Salamis and fetched Leon, but I went quietly home. For which I might have lost my life, had not the power of the Thirty shortly afterwards come to an end. And many will witness to my words. But I shall be asked, why do people delight in continually conversing with you? I have told you already, Athenians, the whole truth about this matter: they like to hear the cross-examination of the pretenders to wisdom; there is amusement in it. Now this duty of cross-examining other men has been imposed upon me by God; and has been signified to me by oracles, visions, and in every way in which the will of divine power was ever intimated to any one. This is true, O Athenians; or, if not true, would be refuted. If I am or have been corrupting the youth, those of them who are now grown up and have become sensible that I gave them bad advice in the days of their youth should come forward as accusers, and take their revenge; or if they do not like to come themselves, some of their relatives, fathers, brothers, or other kinsmen, should say what evil their families have suffered at my hands. Now is their time. Many of them I see in the court. There is Crito, who is of the same age and of the same deme with myself, and there is Critobulus his son, whom I also see. Then again there is Lysanias of Sphettus, who is the father of Aeschines, he is present; and also there is Antiphon of Cephisus, who is the father of Epigenes; and there are the brothers of several who have associated with me. There is Nicostratus the son of Theosdotides, and the brother of Theodotus (now Theodotus himself is dead, and therefore he, at any rate, will not seek to stop him); and there is Paralus the son of Demodocus, who had a brother Theages; and Adeimantus the son of Ariston, whose brother Plato (4) is present; and Aeantodorus, who is the brother of Apollodorus, whom I also see. I might mention a great many others, some of whom Meletus should have produced as witnesses in the course of his speech; and let him still produce them, if he has forgotten, I will make way for him. And let him say, if he has any testimony of the sort which he can produce. Nay, Athenians, the very opposite is the truth. For all these are ready to witness on behalf of the corrupter, of the injurer of their kindred, as Meletus and Anytus call me; not the corrupted youth only, there might have been a motive for that, but their uncorrupted elder relatives. Why should they too support me with their testimony? Why, indeed, except for the sake of truth and justice, and because they know that I am speaking the truth, and that Meletus is a liar. Well, Athenians, this and the like of this is all the defense which I have to offer. Yet one word more. Perhaps there may be some one who is offended at me, when he calls to mind how he himself on a similar, or even a less serious occasion, prayed and entreated the judges with many tears, and how he produced his children in court, which was a moving spectacle, together with a host of relations and friends; whereas I, who am probably in danger of my life, will do none of these things. The contrast may occur to his mind, and he may be set against me, and vote in anger because he is displeased at me on this account. Now if there be such a person among you, mind, I do not say that there is, to him I may fairly reply: My friend, I am a man, and like other men, a creature of flesh and blood, and not 'of wood or stone,' as Homer says; and I have a family, yes, and sons, O Athenians, three in number, one almost a man, and two others who are still young; and yet I will not bring any of them hither in order to petition you for an acquittal. And why not? Not from any self-assertion or want of respect for you. Whether I am or am not afraid of death is another question, of which I will not now speak. But, having regard to public opinion, I feel that such conduct would be discreditable to myself, and to you, and to the whole state. One who has reached my years, and who has a name for wisdom, ought not to demean himself. Whether this opinion of me be deserved or not, at any rate the world has decided that Socrates is in some way superior to other men. And if those among you who are said to be superior in wisdom and courage, and any other virtue, demean themselves in this way, how shameful is their conduct! I have seen men of reputation, when they have been condemned, behaving in the strangest manner: they seemed to fancy that they were going to suffer something dreadful if they died, and that they would be immortal if you only allowed them to live; and I think that such are a dishonor to the state, and that any stranger coming in would have said of them that the most eminent men of Athens, to whom the Athenians themselves give honor and command, are no better than women. And I say that these things ought not to be done by those of us who have a reputation; and if they are done, you ought not to permit them; you ought rather to show that you are far more disposed to condemn the man who gets up a doleful scene and makes the city ridiculous, than him who holds his peace. But, setting aside the question of public opinion, there seems to be something wrong in asking a favor of a judge, and thus procuring an acquittal, instead of informing and convincing him. For his duty is, not to make a present of justice, but to give judgment; and he has sworn that he will judge according to the laws, and not according to his own good and pleasure; and we ought not to encourage you, nor should you allow yourselves to be encouraged, in this habit of perjury, there can be no piety in that. Do not then require me to do what I consider dishonorable and impious and wrong, especially now, when I am being tried for impiety on the indictment of Meletus. For if, O men of Athens, by force of persuasion and entreaty I could overpower your oaths, then I should be teaching you to believe that there are no gods, and in defending should simply convict myself of the charge of not believing in them. But that is not so, far otherwise. For I do believe that there are gods, and in a sense higher than that in which any of my accusers believe in them. And to you and to God I commit my cause, to be determined by you as is best for you and me. Let us reflect in another way, and we shall see that there is great reason to hope that death is a good; for one of two things, either death is a state of nothingness and utter unconsciousness, or, as men say, there is a change and migration of the soul from this world to another. Now if you suppose that there is no consciousness, but a sleep like the sleep of him who is undisturbed even by dreams, death will be an unspeakable gain. For if a person were to select the night in which his sleep was undisturbed even by dreams, and were to compare with this the other days and nights of his life, and then were to tell us how many days and nights he had passed in the course of his life better and more pleasantly than this one, I think that any man, I will not say a private man, but the greatest king will not find many such days or nights, when compared to the others. Now if death be of such a nature, I say that to die is gain; for eternity is then only a single night. But if death is the journey to another place, and there, as men say, all the dead abide, what good, O my friends and judges, can be greater than this? If indeed when the pilgrim arrives in the world below, he is delivered from the professors of justice in this world, and finds the true judges who are said to give judgement there . . . that pilgrimage will be worth taking. What would not a man give if he might converse with Orpheus and Musaeus (5) and Hesiod (6) and Homer? Nay, if this be true, let me die again and again! . . . Above all, I shall then be able to continue my search into true and false knowledge; as in this world, so also in the next; and I shall find out who is wise, and who pretends to be wise, and is not. . . . In another world they do not put a man to death for asking questions: assuredly not. For besides being happier than we are, they will also be immortal, if what is said is true. Wherefore, O judges, be of good cheer about death, and know of a certainty, that no evil can happen to a good man, either in life or after death. He and his are not neglected by the gods; nor has my own approaching end happened by mere chance. But I see clearly that the time had arrived when it was better for me to die and be released from trouble. . . . The hour of departure has arrived, and we go our separate ways, I to die, and you to live. Which of these two is better only God knows. 1 This comic poet is Aristophanes. 2 At Delphi was located the "Pythian Oracle," the temple which housed the prophetess of Apollo who, in riddling oracles and obscure metaphors, predicted the future and revealed the truth about things. The motto over the Delphi Temple was "Know Yourself." 3 The "son of Thetis" is Achilles. 4 This is the young man who will become the philospher Plato, the writer of the present work. 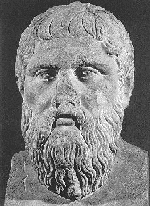 The name, Plato, is a nickname and means "broad forehead." 5 The legendary first poets of Greece. 6 A rough contemporary of Homer's, coming just a little bit later. He is considered the second great foundational poet of Greece, and his two works, The Theogeny, a poem about the creation of the universe by the gods, and The Works and Days, a type of "wisdom" poem, were almost as important in Greece as the Homeric epics.